Healthy and instant Rava Idlis can be made under half an hour, when you run out of other breakfast options for the week. Serve them alongside your favorite side of sambar or chutney and help you and family, start their day right. This post has affiliate links! 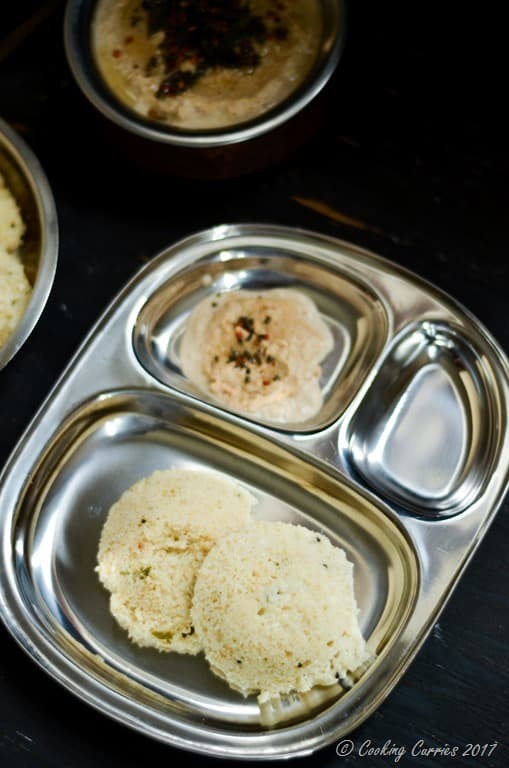 Idlis – wonderful pillowy steamed white cakes – are one of the staple South Indian breakfast dishes. Regular plain idlis are made from fermented batter of rice and urad dal (skinned black lentils). Since they are steamed and there is no oil or any other form of fat added to it, they are perfect for easy digestion when you have a mild flu, fever or something. They are a prefect breakfast for little kids too! 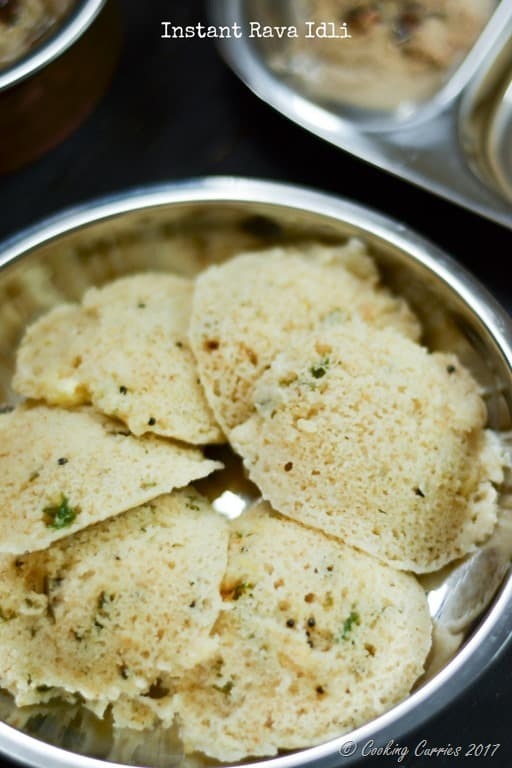 Idlis can also be made from semolina. These are much easier and quicker as there is no need of soaking the rice and lentils and then grinding them and fermenting the batter. To get the fermented effect, some yogurt and/or buttermilk is added to the semolina – rice flour mixture and left aside for 15-20 mins. So, literally you can get up one morning and decide to make rava idlis then and there, as opposed to regular idlis! I wasn’t a big fan of idlis when I was a little girl and the only way that I would eat idlis was with some sugar mixed with ghee/clarified butter smeared on top. 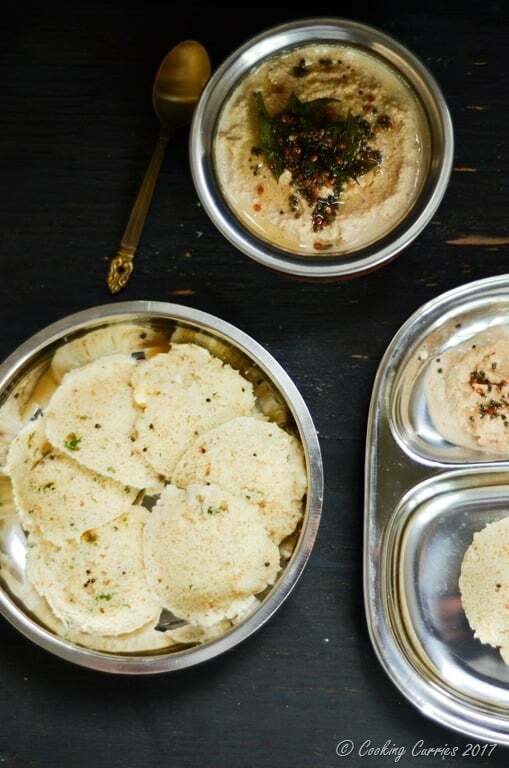 Only later in life that I got addicted to idlis with chutneys , sambar and / or molagai podi (a lentil spice mix that Idlis and Dosas are eaten with). Aaahh, just writing this post itself is making me want to break a piece of a soft idli, dunk it in sambar and devour it. A cup of steaming hot milky frothy filter coffee is all you need to complement it! Now what on earth is that? You may ask. 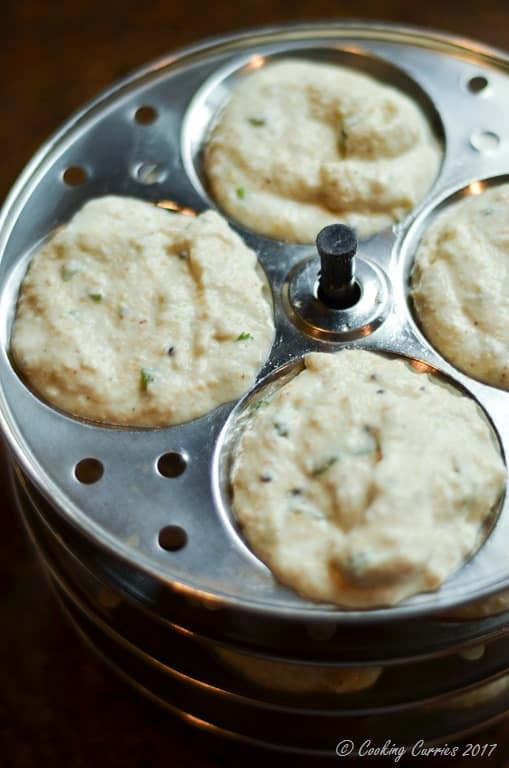 It is one of the special apparatus needed to make these idlis. They are idli plates with a stand. You can buy them here. There is also idli plates to use in a microwave, I have used it a few times and it is not really bad. I would still prefer the traditional stands for stove top steamer though. You grease each depression of the plates with a little oil and pour the idli batter into each of those round depressions and place them in a tight closed pan ( I use my pressure cooker without the pressure weights) with a little water in it and steam for about 10 mins or so till the idlis are done. You can check for doneness just like how you would check a cake, insert a skewer or just the tip of a knife into the idlis and if it comes out clean, the idlis are done. You can just loosen them out from the side with a flat spoon and just scoop them out. Serve hot with sambar or chutney or both! 🙂 Here are some of our favorites! In a wok, dry roast the semolina and rice flour on medium-low heat till they turn very light brown and a nice aroma of roasted flour comes. Keep aside and let it cool a little. To this, mix the yogurt, baking soda, ginger, cilantro and salt. Mix well. Add the buttermilk, a little at a time, mixing after each addition till the batter is slightly lighter than a pancake batter. Heat the oil for tempering, add the mustard seeds and once they splutter, add the curry leaves, green chillies and asafetida. Pour this on top of the idli batter and mix it in. Let it rest for at least 15 mins. Grease the idli plates and pour the batter into each of the depressions. You can fill them almost to the brim. Just be careful when putting all the plates together and transferring them to the steamer. Steam them till the idlis are done. Try inserting a toothpick and see if it comes out clean. 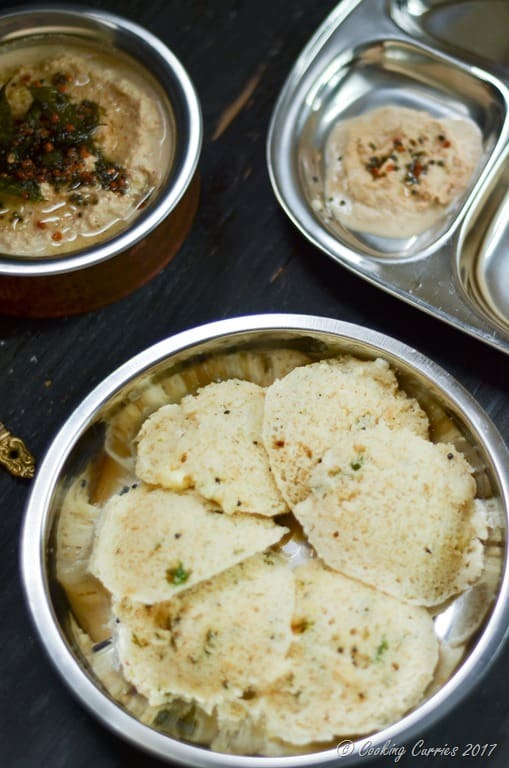 Enjoy the warm idlis with sambar or chutney of your choice.